Better late than never! This week’s – as it turns out: rather divisive – style column. When I “need” new shoes I don’t usually go: I MUST have sneakers. Immediately! 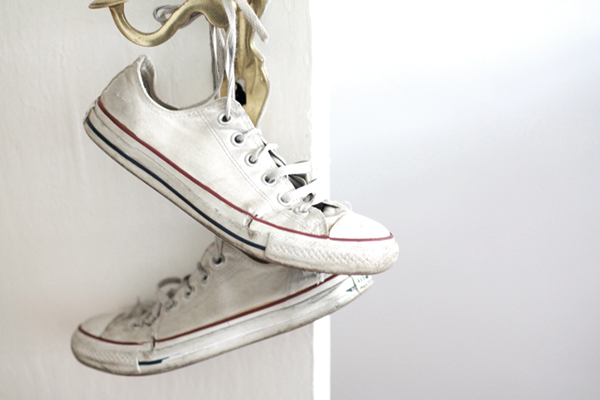 My routine is that I swap the old pair of Converse for a new pair of Converse every couple of years, normally around the time the old pair have holes big enough to soak up puddles. At first I bought the shoes in black, then in white (the question “Hi-tops or Lo-tops?” is as superfluous as the question “St. Pauli or HSV?” – if you have taste you shouldn’t have to ask it). It’s time for a new pair of trainers again and I suddenly think I might’ve outgrown my Converse. I blame Lexi and her Isabel Marant sneakers. Since they’re completely sold out, how about a pair in grey from New Balance? Or maybe the Nike AirMax? Or a pair of white Supergas? Which trainers would you buy right now? This entry was posted in fashion, hers and tagged style column. Bookmark the permalink. Post a comment or leave a trackback Trackback URL. Oh! In Blue Iris mag ich sie aber sehr. Und in weiß allerdings auch. Bin immer noch unentschlossen, welche die nächsten Turnschuhe sein sollen. Gerade denke ich: New Balance. Schon, weil ich in denen zumindest so tun kann, als sei ich irgendwie sportlich. Ha! oh mich grad naiv in die converse-kontroverse rein geklickt. ui. ehm. naja, ich bleib bei superga ;o) und zwar hier. Vielleicht ging es bei der Kontroverse gar nicht um Turnschuhe. Sondern um den Vergleich St. Pauli/HSV! Damit bin ich nun wirklich zu weit gegangen. Thanks, Ashley! I still haven’t bought a new pair. And all of these sound like I was right to wait. Now, where’d I put my credit card?